This entry was posted in feminism, Movie Review. GREAT review! I saw it the yesterday with my 18-y.o. daughter–it is the perfect mother-daughter film. I'm going to see it again with my husband. Loved the beauty of the Scottish landscape and the active, rebellious heroine. Here's a totally lame and superficial observation I had (without even seeing the film yet): I love that she has wild, curly hair like me. I'm 27 years old, and I still love it when films (animated or otherwise) show characters with curly hair. It makes me feel like this wild mop that I fight with on a daily basis might actually be pretty awesome.That being said, I cannot wait to see this movie—and not just for the hair! I loved it SO MUCH. And I thought that the whole mother thing was freshly done. 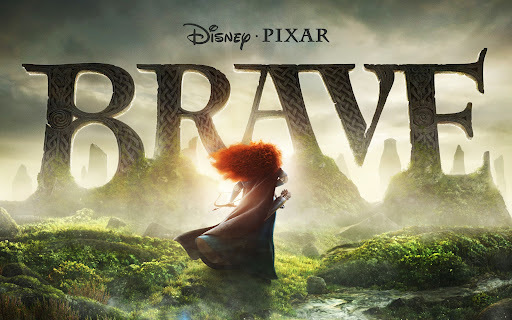 It was so much more than Merida having to overcome gender stereotypes to avoid being married. I really felt she grew as a person. I'll be buying this one for my niece. My friend went to see this this weekend and she loved it it sounds super cute!! Loved it too! I had no idea about Merida's hair. Though it absolutely doesn't surprise me because it was pretty impressive! I want to take my mom to see this movie! It was so good! And the poor reviews it's been getting from some people like that one review you mentioned makes me want to punch something. Very nice review! And those reviewers you mentioned–Ugh! Seriously, who doesn't realize that Pixar is one of the top-notch (if not the best) in animation??? I mean, I like the other types of animation and certainly some might be prettier (Japanese anime, for example, can be really beautiful in my opinion) but Pixar is the best, I think.And what a jerk to say there was a "superficial girl-empowerment theme"!! Basically if you're not going to say that it was great to have a strong female hero that isn't a typical Disney princess in a Disney/Pixar film, you shouldn't say anything because any other comments will make you sound like a sexist jerk. Grumble grumble… I've got lots of other words I'm thinking but I'll just stick with calling that guy a jerk! ;)Fantastic review, Lauren. I need to see this one, ASAP!